GENEVA — On Nov. 14, 1996, armed men surrounded the Mugunga refugee camp in eastern Zaire and began shooting indiscriminately at its inhabitants as they huddled for safety or tried to flee. Hundreds of men, women and children died over a three-day period, according to eyewitnesses and forensic evidence later gathered from mass graves. A report published Friday by the U.N. human rights office says the killings at Mugunga may have been one of many instances that qualify as crimes against humanity or even — taken together — genocide by the Rwandan army, which at the time was hunting down Hutu rebels in neighboring Zaire, now called Congo. The genocide suggestion sparked an angry response from Rwanda, whose President Paul Kagame has basked in international approval for ending the 1994 genocide there, during which more than half a million people, mostly Tutsis but also moderate Hutus, were killed. Calling the report "flawed and dangerous from start to finish," Rwandan Foreign Affairs Minister Louise Mushikiwabo said it was an attempt to rewrite history. 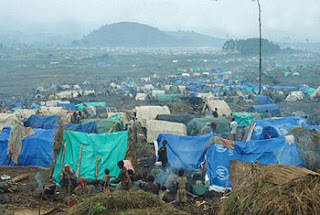 In a written riposte to the United Nations, the Rwandan government said its troops "never fired any weapons into the camp" at Mugunga and civilians only were killed when armed rebels inside the camp tried to stop people from fleeing. Later, civilians who were held as human shields by the rebels died in the crossfire, it said. The Red Cross and other organizations cited in the report refused to comment on it, saying the subject was too sensitive in light of ongoing human rights abuses in the region. The U.N. says more than 500 rapes have been committed in eastern Congo since late July. Previous reports have described massacres and indiscriminate killings in Congo. But the latest report's depth will make it harder to ignore, experts say. The report cost $3 million to produce and details 617 incidents from 1993 to 2003, when a five-year civil war that killed millions through disease and neglect ended. It concludes that tens of thousands of people — mostly women and children — were slain in attacks by the many armed groups roving eastern Congo. U.N. High Commissioner for Human Rights Navi Pillay stressed in a statement that the report "is not a judicial investigation" and "does not establish individual criminal responsibility." The aim of the report "was to encourage efforts to break the cycle of impunity and continuing gross violations, by showing the scale and seriousness of the violations of human rights and international humanitarian law," she said. Martin Nesirky, spokesman for U.N. Secretary-General Ban Ki-moon, backed Pillay's statement, saying "it's about helping them to fight impunity and avoid perpetuation of this cycle of violence which we have seen even in the past month. "The Congolese government welcomed the report's suggestion that a tribunal be set up to prosecute those responsible. Congo's ambassador to the United Nations in New York, Ileka Atoki, described the report as "heartbreaking" and "horrific." "The victims deserve justice," said Atoki. "The Congolese government is firmly committed to that endeavor," he said, proposing an international meeting in Kinshasa to discuss the report. Amnesty International said the report was "very thorough." "What we want now is for action to be taken," said Veronique Aubert, the group's deputy Africa director. "The cycle of violence in the region will only stop if those responsible for these horrific crimes are held to account." The report has reopened old wounds in Africa's Great Lakes region, where massive mineral wealth has fueled conflict even as many people in the region live in dire poverty. Rwandan and Ugandan officials mounted a sophisticated public relations campaign before the report's release. They distributed detailed attacks on the findings and warned that their governments might pull out of U.N. peacekeeping operations. Rwanda's President Paul Kagame dropped that threat just a few days ago. It would have been a major blow to the 22,000-strong U.N.-African Union force in Sudan's Darfur region which is commanded by a Rwandan general and includes more than 3,200 Rwandan troops. Asked whether the secretary-general had done "a tradeoff" with Rwanda — that the U.N. wouldn't push for judicial steps to follow up the report if the government kept its troops in Darfur and other peacekeeping missions — U.N. spokesman Nesirky replied: "There's no linkage, no quid pro quo. Any follow up would be on its merits." Mushikiwabo, the Rwandan foreign minister, said the U.N. was trying to "undermine the peace and stability attained in the Great Lakes region." Ugandan foreign ministry spokesman Guma Muganda called the report "fake and malicious." Muganda said Ugandan soldiers were never deployed in areas where they are now accused of crimes. One incident the report said involved Ugandan troops took place in the night of June 5-6, 1996, in the border village of Bunagana. Rwanda and Ugandan soldiers allegedly killed at least 28 civilians, mostly Rwandan Hutus. "Tutsis from Bunagana are thought to have been used as scouts, pointing out the houses of people to be killed to the commandos," the report said. Ugandan army spokesman Felix Kulayigye said troops never killed anyone at Bunagana. The first challenge in prosecuting anyone will be proving that crimes on the scale described actually took place, said Louise Doswald-Beck, a law professor at Geneva's Graduate Institute. "There is a big difference between doing a fact-finding report, where you evaluate the evidence on the balance of probabilities, and convicting someone in a criminal tribunal, when you need to prove that someone is guilty beyond reasonable doubt," she said. In the end, prosecutors may choose to pursue only accusations of crimes against humanity, which have a lower burden of proof than genocide, an act that must have been planned, said Doswald-Beck. Rwandan officials warned of consequences. "This is a report that is capable of destabilizing the whole region and even capable of destabilizing the peace process and reconciliation in Rwanda," said Venetia Sebudandi, the country's Geneva ambassador. Anneke van Woudenberg, senior Congo researcher for New York-based Human Rights Watch, said prosecutions will depend on the U.N. Security Council and Rwandan cooperation. "We know that Rwanda plays hardball," she said. "But if they want a lasting peace they are going to have to compromise."